Second X-class Flare, this time in motion! 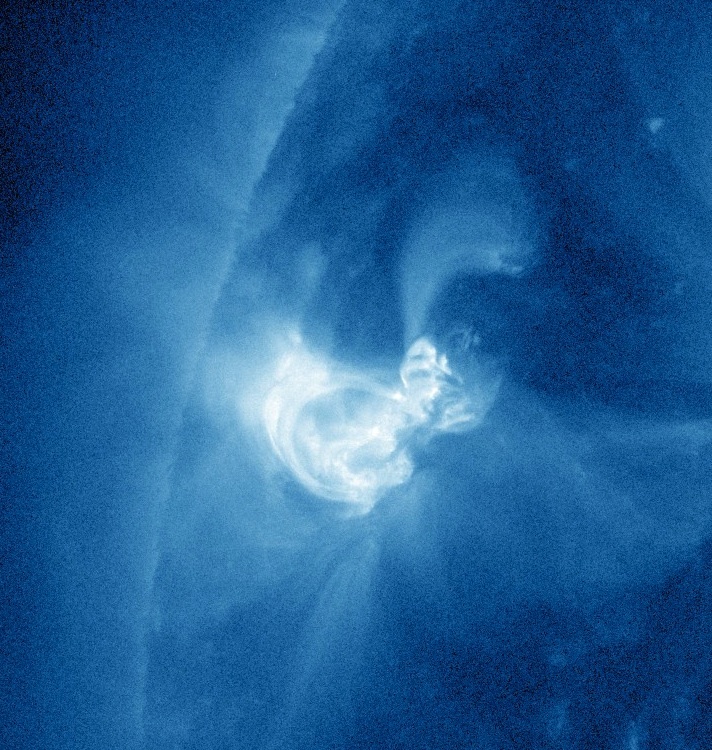 Here's a movie of the second X-class flare, which erupted at 1605 UTC on 13-May-2013. This movie uses the AIA 131 passband, which is measuring plasma at 10 million K. This flare is in a region that just rotated onto the visible disk. After the flare appears you can see the emission climb out away from the Sun as the loops expand outward. Last night at 0200 UTC (10:00 pm ET) the Sun unleashed a an X1.7 flare! 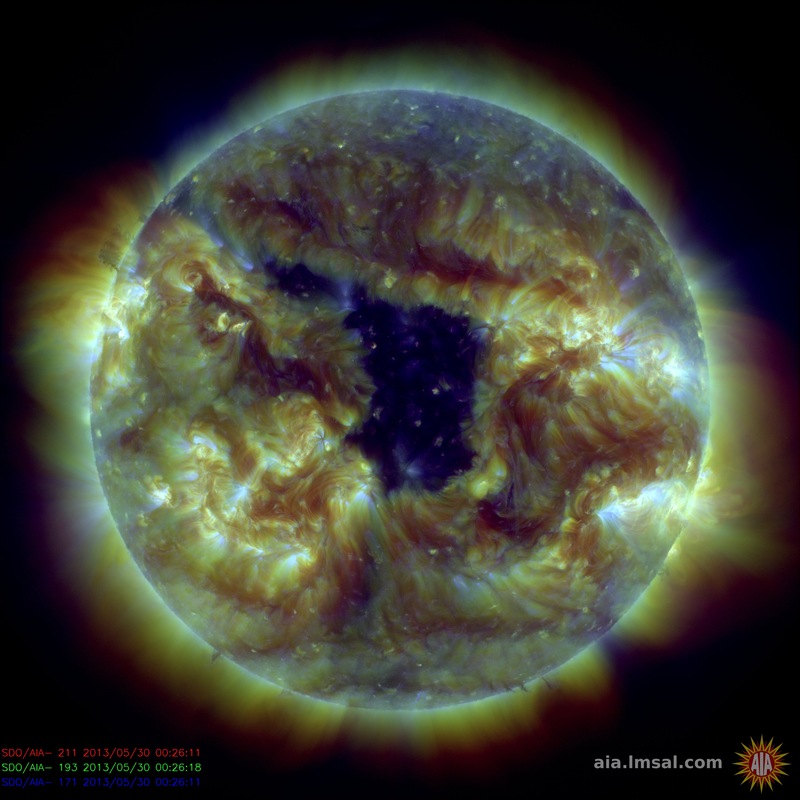 It was over the east limb (left edge of SDO images) from the viewpoint of SDO. NOAA places it at 15 degrees North latitude, meaning it is in the active region latitude band. 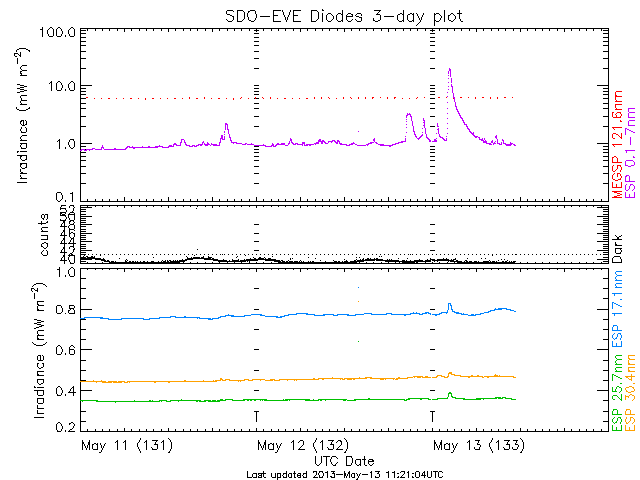 Here is the EVE irradiance measurements showing the increase in solar output at wavelengths between 0.1 and 7 nm. 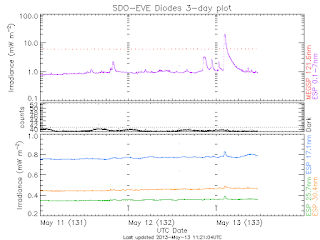 For a new view of a flare, here is the AIA 1600 channel for 0248 UTC 13-May-2013. 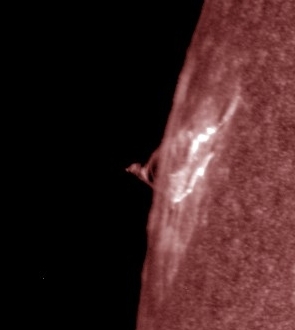 It shows a nice set of loops rising over the flaring region, which is just over the limb. This channel measures C IV emissions. These loops are about 26 Mm (16 million miles) high, a little over twice the diameter of the Earth. 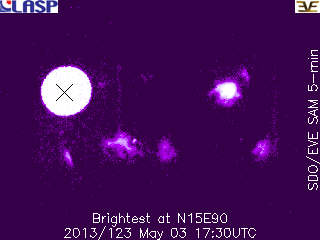 They are visible about 21 minutes after the peak in the X-ray irradiance. The same region has produced another X flare, this one an X2.8! I hope it keeps this up as it rotates into view. 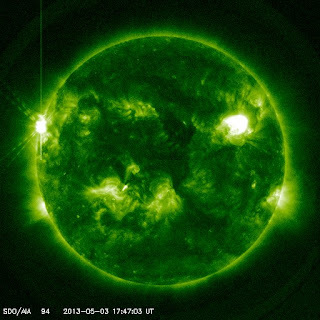 NOAA announced that the solar X-Ray Flux exceeded M5, 2013 May 03 1729 UTC (2:29 pm ET). Here's a view of the peak brightness of the flare from the EVE SAM camera. SAM is pinhole camera that is sensitive to X-rays. The X marks where the flare overwhelmed the CCD. 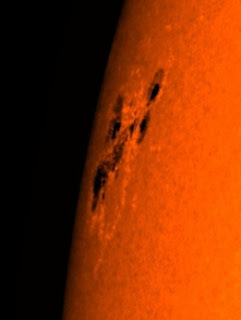 Another view showing the flaring region in the upper left limb of an AIA 94 image. 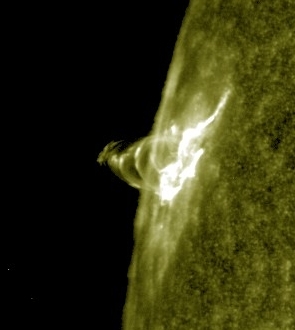 The active region that flared has not yet been assigned a number, but keep an eye on it as it rotates into view! Check out the Weather Channel website. 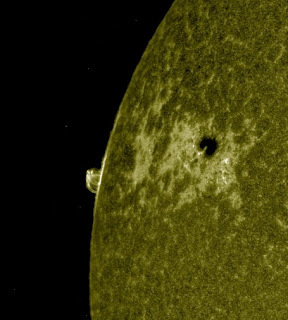 There are several movies from SDO and even one about a special bird named Camilla! I also saw a story about space junk, which more solar activity would help clean out of low-Earth orbit. More sunspots please!